The many recordings that Nussbaum’s heard on also tend to impress: Joey Calderazzo’s debut In the Door and John Abercrombie’s organ-trio album Tactics, to name just two. Then there’s the fact that 40 years on from the time Nussbaum first hit the scene—supporting singers Joe Lee Wilson and Sheila Jordan in 1976—he’s finally recorded his own album as a leader, and it’s a welcome surprise. The Lead Belly Project is a fun, melody-focused album dedicated to a first love from his parents’ record collection: Huddie Ledbetter—Lead Belly—the white-haired 12-string bluesman who sang his way out of prison and left a legacy of folk songs, many from a time before the blues. Eleven are interpreted here, including “Grey Goose,” “Black Betty,” and “Bring Me a Little Water, Sylvie.” What makes this recording most surprising is how Nussbaum treats the music—not simply stretching out its structures but, with air and a sense of innocence, letting the melodies lead the way, rendered by an unusual lineup: drums, two guitars (Steve Cardenas and Nate Radley), and tenor saxophone (Ohad Talmor). Another thing to know about Nussbaum: He hangs on to puns, one-liners, and malapropisms like nuts for a long winter—and he’s happy to share them (“Please keep me deformed,” “Is this aqueduct for your porpoises?”). This, his first Before & After, took place in one of the studios at New York University’s Clive Davis Institute for Recorded Music. “My Heart Belongs to Daddy” (Whereas, Sunnyside). Jaleel Shaw, alto saxophone; Robert Rodriguez, piano; John Sullivan, bass; Haynes, drums. Recorded in 2006. BEFORE: Nice take on “My Heart Belongs to Daddy.” First of all, I like the atmosphere they’re creating, the drummer’s keeping it under it because he’s giving himself somewhere to go. You don’t want to give it up right away. They’re still expounding the melody, so that’s got to be the first priority. It’s not one of the elders—it could be one of the cats like maybe Eric Harland. It’s not Jabali [Billy Hart]. Maybe he’s older—Michael Carvin? AFTER: It’s Haynes, fantastic. When I hear Roy Haynes I always think he was born in the future. I’ve told him that. He’s so timeless with what he does—and his ability to play in the cracks is fascinating for me. What I mean is he has that ability to put his ideas anywhere he wants to, not necessarily on the upbeat or the downbeat. And he’s so quick. What we’re hearing is spontaneous reactivity. When you hear his ideas, he’s always dancing around that core, and he always has a strong bass player, which frees him up to bob and weave. He’s always sounded modern and you’re never hearing a lot of worked-out licks or vocabulary. His knack, like with all the greats, is to orchestrate the music so that it elevates it to so many beautiful places. You fooled me. But this was a live recording, and with him usually the sound thing is distinctive and that was not easy to hear, especially his cymbal. Roy Haynes—forever young. God bless him. “Soulful Drums” (The Soulful Drums of Joe Dukes and the Jack McDuff Quartet, Prestige). Red Holloway, tenor saxophone; George Benson, electric guitar; Jack McDuff, organ; Dukes, drums. Recorded in 1964. BEFORE: [Immediately] That’s “Soulful Drums.” It would be Joe Dukes, with [Jack] McDuff. This was a great hit—such attitude and commitment to everything Jack did, and drama from the drummah. When was it, ’67? Okay, ’64. What a quartet. It sounds like one organism. Any band that has a great combination of people and creates a unique sound is something we have to appreciate. There was McDuff, Red [Holloway], Dukes, and it was either Benson or Pat Martino. There’s no pussyfooting around here; everything is clear, definite. It’s really got that street command. This is so visceral. There’s no science going on, it’s not trying to be cute. The Hammond [organ]’s got so much power, so Joe had to hit it, the way he paces the solo and uses the space is great and it grabs your attention because it’s not just a barrage of notes. I’m not sure what happened to Joe Dukes, but the organ trio was the main thing that he was known for. I don’t know him in too many contexts outside of being in this scene. “We See” (Play Monk and Powell, Winter & Winter). Chris Potter, alto saxophone; Chris Cheek, tenor saxophone; Steve Cardenas, Kurt Rosenwinkel, electric guitar; Steve Swallow, electric bass; Motian, drums. Recorded in 1998. BEFORE: Okay, this is Motian and it’s Swallow, his is one of the most distinctive sounds there is. “B Bach,” I call him, because everything he plays is so clear and in a row. Swallow’s one of my favorite musicians and I’m very grateful to have had him in my life for almost 40 years. That probably could be Chris Potter, maybe [Chris] Cheek, and I’m not sure who was on guitar. That’s Motian’s Electric Bebop playing a Monk tune—I can’t remember the title. I like the feel of this. That’s what I’m attracted to first of all: How does it feel, what’s the feel of the swing and of the time? I hear how Paul and Steve work together—a good team, people of similar age who have both kept their ears open. They’re still looking but they’re really grounded in a tradition. If you notice, when he plays it’s this [mimics upstroking motion across bass strings], it’s not this [downward plucking motion]. Like playing the upright. I do listen to other drummers but you don’t usually play with other drummers, so it’s bass players I hear most. I learned about time mostly with bass players, trying to find that “kumbaya” and create that good foundation for everyone else in the band. That’s why it’s been so valuable for my development playing with Steve Swallow, who’s 15 years my senior, and with Ron McClure, Eddie Gomez, Ron Carter, George Mraz, Niels-Henning Ørsted Pedersen, George Duvivier. Drummers got to understand bass players, just like bass players have to learn about the drummers’ time and our cymbal beat. As I like to say, we gotta get that spiddle-a-ding to go with the ickity-boom. “Ramblin’” (Going Back Home, Atlantic). Bill Frisell, electric guitar; Charlie Haden, bass; Baker, drums. Recorded in 1994. BEFORE: The drums have a rock sound more than a jazz sound and I kinda have a feeling it’s Ginger Baker, Charlie [Haden], and [Bill] Frisell. Sonically I could tell right away—I never heard this record but I heard about it. This is cool. Ginger’s rocking, man, he’s happening. I like it too because there’s a clarity and openness in what he does. 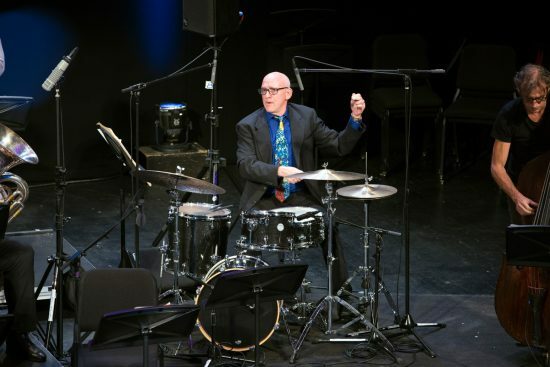 Ginger wants more than anything to be considered a jazz drummer and he’s one of the great drummers in the zone that he created. What he brought to the Cream with Jack Bruce was pushing Eric Clapton big-time. It wasn’t them just playing a steady little groove behind him, they were hitting. I thought it was incredible because they really played like a jazz band—taking a lot of risks. When I was 13 or 14, they had a heavy effect on me. They were part of what was happening at the time: the Cream, Jimi Hendrix, the Who, [Led] Zeppelin. It knocked me out then, it still knocks me out. How many times have I heard A Love Supreme? It knocks me out more now. “Swisha Suite” (August Greene, self-released). Common, raps; Robert Glasper, keyboards; Karriem Riggins, drums, samples. Recorded in 2017. BEFORE: Is it real or is it Memorex? There’s some of that going on here. I like that. I’m enjoying the layers of humanity coming in besides all the process—the keyboard came in, the voice came in, I liked hearing the real sounds mixed in with the samples and machines. I don’t know who it is but there’s this thing that’s going now, maybe a drummer trying to sound like a machine? It used to be the machines trying to sound like people, now people are trying to sound like machines. It’s interesting, not knowing if it’s a loop or someone playing like that. Whoever it is, they’re really into the processed sound of the drum. It could be a handful of people who are into this zone now—Mark Guiliana, Zach Danziger, Chris Dave, I guess. That’s actually a joke—Mel Brooks and Carl Reiner. You know that one? It’s interesting because this is what’s happening now—a balance of human and machine sounds, and to me music always has to have a balance: on and off the beat, high and low, sound and space, acoustic and electric. It would easily become tiresome to the ear if it was only that processed sound. You have to remember Karriem played with Ray Brown, so he’s got an actual connection to the foundational honesty of this music. And his father played with Grant Green. That was his father? I didn’t know that. Far out. So he’s deep in there. It’s in the blood. “How High the Moon” (The Lionel Hampton/Art Tatum/Buddy Rich Trio, Pablo). Tatum, piano; Hampton, vibraphone; Rich, drums. Recorded in 1955. BEFORE: Okay, “How High the Moon.” The first people that come into my mind—it’s Art Tatum or possibly Oscar [Peterson] on piano. I think it might be [Lionel] Hamp[ton] and it could be Buddy [Rich]. With the brushes like that it could be Jo Jones, but then again Buddy was very good with them. These are pre-bop cats. This is that Tatum-Hamp record with Buddy. I’m sure now that we’re hearing it when he’s taking his solo—the clarity of his ideas and his articulation. Just the trio. I haven’t heard this record in zillions of years. There’s a lot of joy and exuberance here and Buddy, man! Everybody always talks about him as a soloist but he always would play what the music called for. He’s on Charlie Parker With Strings, Ella and Louis, and that great record with Lester and Nat Cole—just grooving and swinging the band and when the time came for him to take a solo it’s astounding. “Elvin’s Guitar Blues” (Heavy Sounds, Impulse!). Jones, acoustic guitar, drums; Frank Foster, tenor saxophone; Billy Greene, piano; Davis, bass. Recorded in 1966. BEFORE: The sound is just nice right away with the acoustic guitar. It’s not “Elvin’s Guitar Blues,” is it? It is? I’m having to go deep into the catacombs of my cell to remember all this stuff. This is from Heavy Sounds—Frank Foster, Richard Davis, Billy Greene on piano, and a backwards picture on the back cover in which Elvin’s a lefty. I heard a story that [Larry] Coryell was supposed to be on this record too but something happened and he missed the date. I’m so grateful that I grew up around the New York area and was able to hear him when I was 17. The first band that I heard him with was [Dave] Liebman and [Steve] Grossman. I would go down to the Vanguard and I would listen to the band and I would always sit right next to the drums, my little jazz corner of the world. And after a night or two when they see you sitting there they know you’re a drummer, you can always tell when there’s a drummer sitting by you. We all know how great Elvin played and what a wonderful musician he was, but he was always so kind to me. Very encouraging and supportive. The thing about this tune is that it’s a little blues, primarily a feature for him playing on the guitar, and you’re thinking if it’s Elvin it’s usually an all-out, aggressive swinging thing. You don’t have to hit people over the head to get them. He could play with the brushes and get the whisper and incredible intensity. I think that’s something with all the great musicians. I remember one gig in particular, I was still at home in Connecticut, it might have been ’72, a concert at the Longshore Country Club in Westport and they were having an afternoon of jazz with Maxine Sullivan and her Merry Men of Jazz, the crowd is wearing sundresses, seersucker suits, and having cocktails … and who was the band? Zoot [Sims], Jimmy Nottingham, Hank Jones, Art Davis, and Elvin! One microphone just for her, everything acoustic. I had never heard Elvin outside of playing with his own bands or with Coltrane, and he was playing the most supportive way you could. Maxine was about as big as a lentil and she was singing songs from back in the day—“’Deed I Do,” “A Sailboat in the Moonlight”—one rim shot would have knocked her over. I went up to him on the break and said, “Wow, I never heard you play like this.” He looks at me and says [mimics Elvin’s raspy voice]: “You gotta play the gig! … oh, and my big brother is here.” It was so great to see the maturity of him as a musician—you have to play what the music tells you to play. That was a fairly profound lesson that day, very revealing. “The Serpent’s Tooth” (Symbiosis, Verve Forecast). Tamir Hendelman, piano; Christoph Luty, bass; Hamilton, drums. Recorded in 2009. I saw this trio at Dizzy’s earlier this year and I was knocked out. Jeff’s so assured. Great command of the instrument, great fluency of ideas. It’s swinging and it’s confident, but it’s not too tight. Firm, but there’s some flexibility in there. There’s a fun factor. You definitely hear he’s got an understanding of everyone who’s come before, of Max [Roach], Philly Joe [Jones], Mel [Lewis], Shelly [Manne], and he’s been able to put it together and he takes no prisoners. Can’t forget one of his mentors, the great John Van Ohlen. This is not about changing the world like what Karriem did, but this is truthful in its own way—the quality of it is so high. It’s like a great little big band with these nice arrangements. “Everybody’s Party” (I Can See Your House From Here, Blue Note). Metheny, Scofield, electric guitars; Steve Swallow, bass; Bill Stewart, drums. Recorded in 1994. BEFORE: [Immediately] Okay, you could stop it. The first thing I hear I know is Sco’s sound, that’s singular, and Bill Stewart—he’s got a distinctive sound, a fantastic musician, he’s got great popping clarity and he’s got quick ears. He makes inspired choices. Oh wait, it’s two guitars. I can’t tell who until they solo [listens]. It might be the one with Sco and Pat—I Can See Your House From Here. The title’s a punch line to a funny joke, you know … when I grew up in Norwalk, I was in a band with a buddy, Brian McHale, who took lessons with John [Scofield]—John was in a band called the Skylarks. He was four years older and when you’re 13, 17, that’s a big deal. We’re still little squirts and they were like the grownups. I got hooked up with John again around ’76-’77 when I was living on West 26th, on the same block as Steve Slagle and Dennis Irwin and a bunch of other cats who had gone to Berklee with Sco. I’ve been very lucky to play in some good groups with John. “Supreme Love Dance” (Which Way Is East, ECM). Lloyd, alto saxophone; Higgins, drums. Recorded in 2001. BEFORE: My initial, initial idea is that it’s [Anthony] Braxton and Max [Roach]. No, wait—it’s somebody who’s definitely influenced by Max. Maybe Steve Wilson and Lewis Nash. Nasheet [Waits]? Or no, it is somebody from back in that era, one of the older guys. In the beginning it definitely had some Max. Now not so much. I know it’s going to be so obvious when you tell me. AFTER: Nice. When I first hear Higgins normally, the thing that’s most identifiable is his cymbal beat and the glide of that ride. It’s so beautiful and transparent. Also this felt so organized. In the beginning there was a certain degree of that order—AABA—very architecturally structured. But because Billy was playing in a duo situation and not playing time with a bass player, there’s more coming off the drums and you can hear he had assimilated a lot of drum history language. Of course it was him—he was like a modern Klook [Kenny Clarke] in a way. There was so much depth to his playing and he always made everybody sound good. I used to hear him a lot when he was playing with Cedar [Walton]. I remember one Christmas week bringing my son to the Vanguard when he was about four years old and sitting in the seats right next to the drums. He’s on my lap and Billy just kept smiling at him, and he was like, “Daddy!”, getting nervous because Billy was smiling so much. Then Lorraine [Gordon] came up to me a week or so later and says [mimics Lorraine’s voice], “I don’t like kids in the club,” and he was probably the best behaved person in the club that night! She was so cranky. May she R.I.P. Anyway, amen for Billy Higgins. “Big Rig Jones” (Jersey, Motéma). Jason Rigby, tenor saxophone; Fabian Almazan, piano; Chris Morrissey, bass; Guiliana, drums. Recorded in 2016. BEFORE: An episodic composition. Feels like it’s the drummer’s date. I like the different atmospheres, very dynamic, takes you on a nice journey. I can’t hear the cymbal beat as well as I’d have liked to—that may also just be the wear and tear [points to ear]. Good sound. Is this Guiliana, the band with Jason Rigby? I’ve heard these guys live. I enjoyed it. There’s a nice balance to what’s going on. I like the way they orchestrated what’s happening with the composition. “Stomp and Buck Dance” (Southern Comfort, Blue Thumb). Wilton Felder, electric bass, tenor saxophone; Wayne Henderson, trombone; Larry Carlton, electric guitar; Joe Sample, keyboards; Stix Hooper, drums. Recorded in 1974. BEFORE: I like how the drummer’s just holding that groove right in there and I like the feel, I like what’s going on with it. There’s a little bit of playfulness, and as the tune is going on he’s starting to expand the density of what he’s playing. He’s really pacing himself and holding it in check, building the tension. This is definitely from that whole wave of groove that took over jazz in the late ’60s and ’70s. Part of the thing evokes [Bernard] Purdie. Stix [Hooper] is in my mind too, because I’m hearing some of the stuff with the keyboard and it reminds me of Joe [Sample] because I played a few years with him. Of course I was aware of some of those Crusaders tunes, but we were just playing trio acoustically. AFTER: Where is Stix these days? I have this record. These guys were coming from such a different vibe than a New York street kind of vibe. Joe was always talking about the Mississippi delta and Texas and stuff like that. I was first aware of the Jazz Crusaders—records like Live at the Lighthouse [’66] with Leroy Vinnegar. When they made the shift to the Crusaders, they got more into the groove and the blues and the backbeat thing, which seemed to be more of their unique heritage. But Stix, man, he had that certain bounce in his groove and the fact that he held it like he did, just keeping it in there, was great. “Goodnight Irene” (East/West, Nonesuch). Frisell, electric guitar; Tony Scherr, bass; Kenny Wollesen, drums. Recorded in 2004. AFTER: It’s Kenny? Fantastic. Then this is the trio with Frisell and Tony Scherr. Kenny can cover a lot of territory in a very convincing manner and it all sounds honest when he plays. He’s got the bass drum sound kind of like Joey, so loose. I heard him with Sexmob in Israel last year and that band covers so much terrain and what I liked about it was whatever it was, he was playing it, not playing at it. Kudos to him, man. I liked what Bill did with this. At the end of the day people remember a melody, and it doesn’t have to be complicated, and I keep remembering that line from somewhere—that simple is not easy. My parents had those Folkways 10-inch Lead Belly records; one had a cover with this image of him wearing a suit and playing his 12-string guitar and the other one was him wearing overalls and a bandana. I remember thinking how he was both urban and rural, and listening to those records all the time. When I was deciding on a project to do, which is really the first thing I’ve done under my own name, I went back to this music and listened. I remembered every tune, every little nuance, because I heard them so much in those pre-Wonder Bread years and it really had burned deep into me. So I just wrote some of these arrangements out and then figured out how to put some different grooves on them to give each a unique character, because there’s nothing complex with the changes, they’re simple melodies and all pretty straight-ahead. I didn’t use a bass because Lead Belly played a 12-string guitar, so instead I got two six-string guitars, and I got cats who really know how to listen and complement each other well. I didn’t give them much direction. I just said, “Well, if somebody is going to be uptown, somebody should be downtown.” I like this combination of people, and nobody loves a bass more than me but I found that was a challenge—and I welcomed that. It pulled me out of my comfort zone. The challenge now is trying to figure out what I’m going to do for the next album with the same instrumentation.